Before movements and institutions fall apart they become objects of laughter. Many thinkers of the past have commented on the valuable function of humour, laughter and mockery in social life, namely that they help to rectify and to correct course. Henri Bergson’s theory of humour amounted to this. Stendhall said that the aim of comedy in theatre is to expose man to the mockery of the audience and thereby induce corrective action. Charlie Chaplin has also remarked that the function of comedy is to sharpen our sensitivity to the perversions of society. 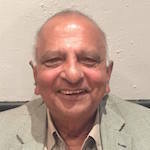 The protest organised around the Federation Square at Melbourne city against Prime Minister Ranil Wickremesinghe who arrived to deliver an oration before an audience of legal academics indeed did exhibit the mutation of a once serious militant Diaspora of the communities into objects of laughter. Two days prior, Hon Ranil Wickremesinghe was awarded an honorary doctorate from Deakin University, Melbourne at its Geelong Campus graduation ceremony. I was present. The ceremony itself had been full of pomp and dignity. It was the first time after six decades that a Sri Lanka Prime Minister had set foot in Australia. When suitable foreign dignitaries are given awards like this it has not been the practice to play the national anthems. Australians this time saw it appropriate to break with tradition and we herd our dear anthem sung, followed by the Australian anthem. The hall was full to capacity with wigs and gowns worn in different colours, Scottish and aboriginal musical performances and so on. Ranil made a speech which shone powerfully for its substance and brevity. He received an echoing and re-echoing applause from the audience. I was in the audience and I felt proud to be a Sri Lankan-although now a domesticated Australian. Ranil cited the Dhammapada and the poet Rudyard Kipling and concluded by encouraging the new graduates to “make it” in this challenging new world of the technological transformation. On the other side of the divide some militant elements of both the Sinhala and Tamil Diaspora were readying themselves for a big protest when the Prime Minister arrives in Melbourne for his oration. One Sinhala militant announced over the local SBS channel that hordes of protestors are to gather. It looked like Ranil’s Waterloo was going to come. Another announced that the Sri Lankan Foreign Minister is due to come soon. “We will surround him,” the guy threatened. The Tamil radio channels and grapevine were also getting charged. Now, the funny thing is that these varied persons claim to be patriots. Here, they assault the University for giving Sri Lanka’s Prime Minister this special honour. And they denigrate the Prime Minister personally. It is a case where Australia honours and Sinhala patriots dishonour a leading son and Prime Minister of Sri Lanka. They also cannot see any good in Ranil Wickremasinghe. Came the 16th of February, yesterday. I was present here, too. I have presented to the Colombo Telegraph editor an image of the Sinhala protestors that shows a crowd of around twenty only! To be honest, this image was taken at around 5.30 pm -about 30 minutes prior to Prime Minister arriving for his oration. Some more crowds would have trickled later; but presumably it would not have been anything significant. The Sinhala group had been allowed well outside the hall, at the back and well away from Ranil’s arrival route. They carried slogans that cried out against ‘revenge over war heroes,’ ‘selling the country,’ and a ‘proposal to have a Federal State.’ No such proposal is out and the draft constitution itself is unknown; but they like to protest at the unseen. Wimal Weerawansa’s arrest may have been in their minds. Indeed! Wimal is a hero! The militant Tamil Diaspora mostly employed young Aussie socialists. Socialism is stone- dead in Australia; yet there are some fair numbers who keep shouting for it. There were only a few tamils in the group. The number in total would not have exceeded fifteen. I tried to take a photograph but I wasn’t allowed by the organisers. 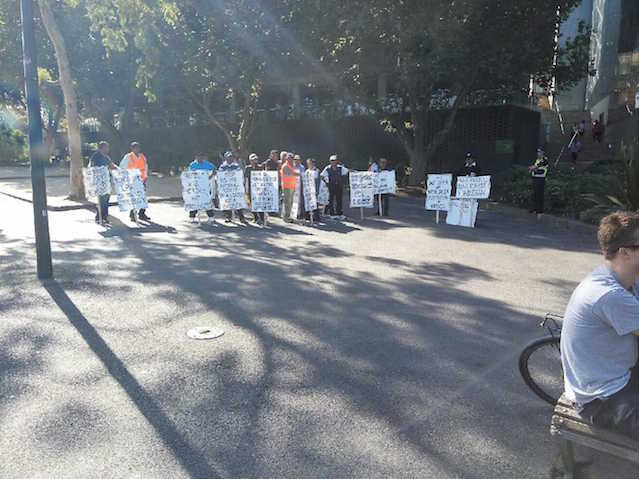 These protestors managed to get themselves heard, unlike the Sinhala fighters outside in the sun. The comedy here was hilarious: Both our Sinhala nationalists and Tamil nationalists had become strange bedfellows. By having Ranil as the common target their shared the bed! However, the weak wails from both sides stopped well before Ranil arrived and the Prime Minister could deliver his speech without any interruption at all. We heard no noise at all while inside the hall. The hall was full to its capacity of 400. The audience had been selected after prior registration. From the Vice-Chancellor downwards it was a gathering of celebrated legal academics. Some prominent Melbourne solicitors were also seen. Another bona fide honour for our Prime Minister! He received another huge applause by all and sundry. Another occasion for Sri Lankan pride! I wonder if there be any Sri Lankan Parliamentarian today who could have matched the quality of presentation by our Prime Minister. Ranil evinced his intellectual grasp and his marination in practical politics over forty years. Our protesting elements would have benefited by getting inside and listening to the erudition of their Sri Lankan leader and sharing the honour he bequeathed to us, instead of dehydrating and languishing in the outside summer – sun. A sharp thought pricked me: Isn’t Ranil Wickremesinghe the last chance for Sri Lanka?